Paintings, happenstance and playful experimentation with the material, interspersed by freestyle choreography to the sounds of inspiration. “This can lead in the most diverse directions,” says Elke Sada, who’s unperturbed by this. 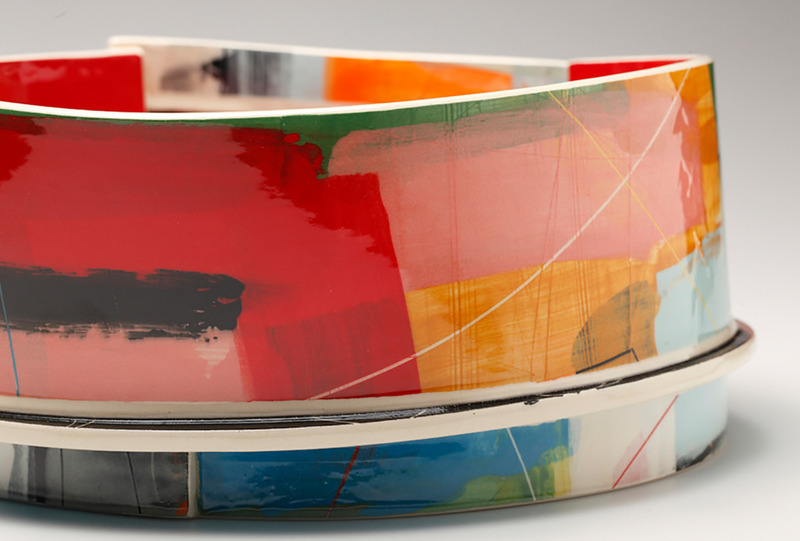 The surfaces of her Capriccio vessels are created from – irreproducible – paintings quiescently eternalized in poured clay plates, pieces of which she combines to form vibrant, cheerfully colored and perfectly functional vessels. “A tango in explosively colorful attire” is how she refers to the dialog with the material from which she crafts her Hallstattpieces. But when she builds her Nests, she transmutes clay into delicate, transparent, almost weightless, life-affirming yet at the same time thought-provoking entities. Elke Sada is a ceramist who takes up the challenge of revealing the versatility of her beloved material with passion while always trying to explore new paths. Vase Capriccio, 2010. White earthenware, coloured slips, transparent glaze, H 24 cm. Photo Michael Wurzbach. Bowl Capriccio. White earthenware, coloured slips, transparent glaze, 31 x 31 x 15 cm. Photo Michael Wurzbach. Bowl Capriccio. White earthenware, coloured slips, transparent glaze, 31 x 31 x 15 cm. Detail. Photo Michael Wurzbach. Jug and mugs Capriccio. White earthenware, coloured slips, transparent glaze, Jug H 26 cm. Photo: Michael Wurzbach. Vase Capriccio. H 28 cm. Photo Michael Wurzbach. Vase Capriccio. H 48 cm. Photo Michael Wurzbach. Vase Pica pica (Hallstattpiece). H 48,5 cm. Photo Anthony Girardi. Vase Panurus biarmicus (Hallstattpiece) von Elke Sada. H 47 cm. Photo Anthony Girardi. Object Capri I (NEST). 16 × 21 × 17 cm. Photo Christoh Kremtz. Object Capri I (NEST). 16 × 21 × 17 cm. Detail. Photo Christoh Kremtz. Object Salon Chinois II (NEST). 19 × 27 × 28 cm. Photo Christoh Kremtz.